We are specialists in offering a wide range of Auto Transformers, known as auto former. 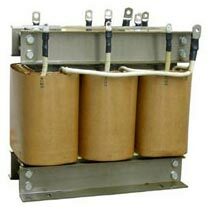 Our Auto Transformers are an electrical transformer with only one winding that has at least three electrical connection points called taps. We fabricate Auto Transformers using quality material to ensure high efficiency and trouble free service life. We are also experts in providing Auto Transformers as per the specifications detailed by the clients. Long rural power distribution lines in which the variable ratio of the auto transformer balances voltage drop along the line.